First Source of Tonawanda, NY, is voluntarily recalling Honey Roast Nut Crunch because it contains undeclared almond. People who have an allergy or sensitivity to tree nuts (almonds) run the risk of serious or life-threatening allergic reaction if they consume this product. 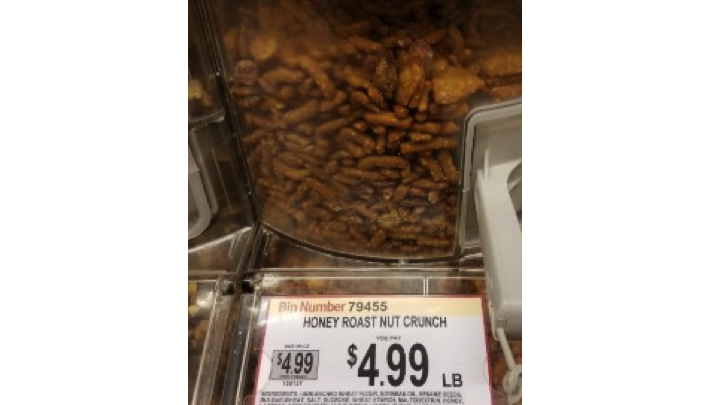 The recalled item was distributed to 30 Wegmans Food Markets in the states of MA, MD, NJ, NY, PA, and VA, and sold by the pound in the bulk foods department under the name Honey Roast Nut Crunch. The affected product was sold from October 9, 2017 to October 19, 2017. No illnesses or allergic reactions have been reported to date. Wegmans will place automated phone calls to customers who purchased the product using their Shoppers Club card. The recall was initiated after First Source discovered that almonds were mistakenly added to the mix in place of peanuts. Subsequent investigation indicated the problem was caused by an error during the mixing of the product and a temporary breakdown in First Source’s allergen control process. Consumers who have purchased this item may return it to the Wegmans customer service desk for a refund. Consumers with questions may contact Wegmans Consumer Affairs at 1-855-934-3663, Monday through Friday, from 8 a.m. to 5 p.m.